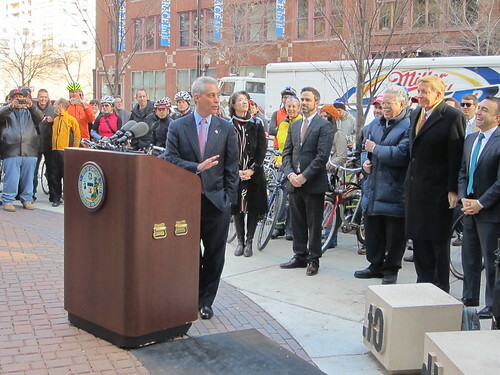 Rahm Emanuel; Gabe Klein is behind him in dark suit. Afterwards Olympic racers John and Christian Vande Velde led the dozens of cyclists on the maiden voyage north. 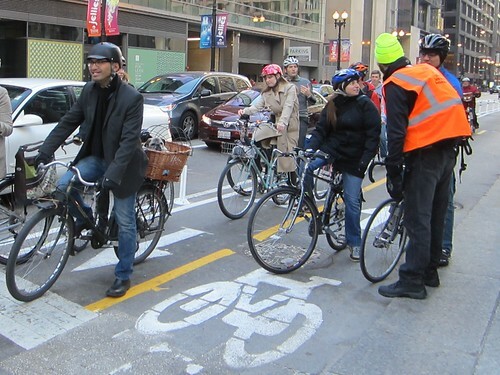 Just like the first time I rode the Kinzie Street bicycle lanes, Chicago’s first protected bikeway, cycling on the new Dearborn Street was a liberating feeling. And when I reached the end of the route and turned around, it was exciting to now be able to safely pedal south on a northbound street.The bike lanes, four-foot-wide northbound and five-foot southbound, look narrow, but actually they’re surprisingly comfortable. Bicycle Ambassadors in orange safety vest and yellow caps were stationed at every intersection all afternoon handing out flyers to pedestrians explaining how the lanes work and reminding them to watch for southbound bike traffic. There’s bound to be a learning curve as peds, cyclists and motorists get used to the new facility, but if all users follow their respective signals I predict we’re going to see a lot fewer crashes than when Dearborn was a three-lane speedway. A nice surprise about the new lanes is how they encourage you to be friendly to other bicyclists. As you cross paths with a cyclist going the other direction, it feels totally natural to say hello, or at least smile. 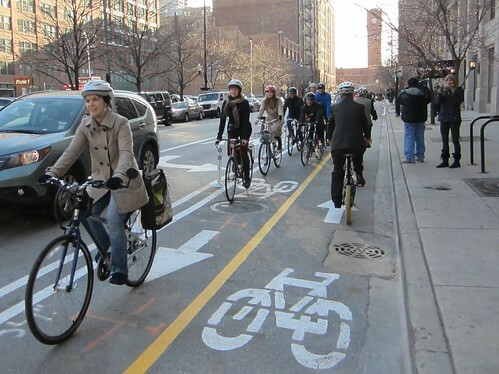 Not everyone is going to be a fan of the Dearborn protected lanes, but most people will get used to them soon enough, and lots of people are going to eventually love them, if not as cycling facilities then for their civilizing effect on the street. 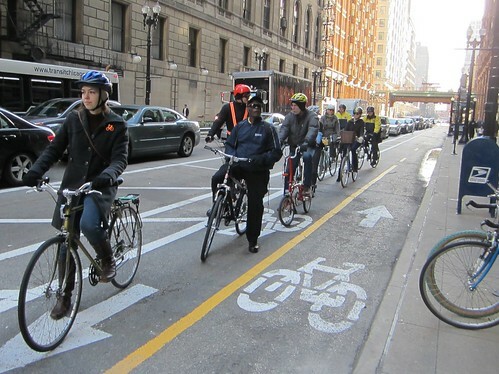 They’re a key milestone on Chicago’s journey to becoming a world-class bike town.